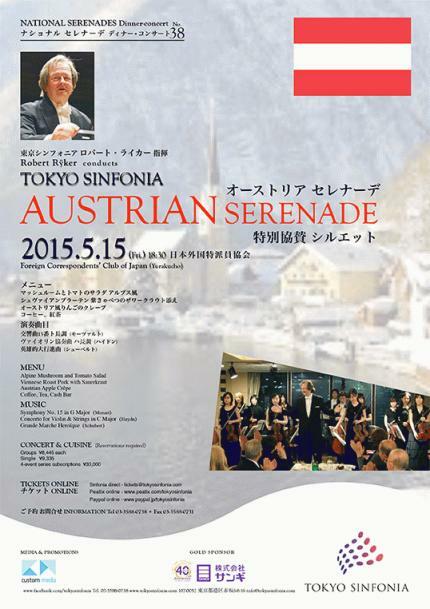 Robert Rÿker and the Tokyo Sinfonia welcome you to another of their “hugely enjoyable” dinner-concert serenades at the Foreign Correspondents’ Club of Japan, high atop the Yurakucho Denki building overlooking the gardens of the Imperial Palace. Combining aspects of both a gracious dinner and an entertaining concert, the perennially popular series has won much praise for its imaginative programming, inviting presentation, and friendly rapport with the audience. Executive chef Kawaguchi’s special occasion menus are another great attraction. The FCCJ’s Austrian-for-the-evening kitchen will tantalise your palate with courses of Alpine Mushroom and Tomato Salad, Viennese Roast Pork with Sauerkraut, and Austrian Apple Crepe. Fresh-baked bread, coffee and tea, and a handy cash bar are a given.